MSR Flylite Tent. The MSR FlyLite minimalist backpacking tent builds upon MSR weight-saving technologies and livable features to offer ounce-counters the lightest possible full-protection shelter available. The 2-person trekking pole tent trims pack weight, so you can ramp up the daily mileage on your PCT thru-hike or fast-packing trip through the Sierras. Backpackers of any pace will appreciate the fully enclosed, single-wall tent for warmth, privacy and bug-free protection. Vertical walls and ample headroom let you stretch out and organize gear, and the large door has a vent to minimize condensation and a large awning with side wings to help keep you dry when the rains hit. 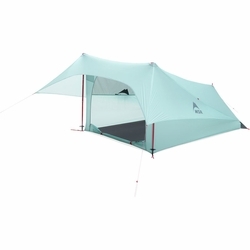 Ultralight: Efficient single-wall tent design pitches quickly with two standard trekking poles. Livable: Greatest volume-to-weight ratio of all MSR� tents, with vertical walls and ample head and elbow room; large vented door with covered entry. Protection: Strong DuraShield�-coated fabric, taped seams and reinforced stress points offer lasting protection.